With a little over 7 days left for the ASOS Fashion Show event, many players are trying to find the best ways to unlock all of the new event items in time. We are going to go over all of the new unlockable items and the best ways to obtain the ASOS Tokens to purchase these new event items. *Note: You must be at least level 6 to start the ASOS Fashion Show event. As you purchase the event clothing rewards you will progress the prize tracker, as pictured above. The first reward is 10 Fashion Gems, to be used in Izzy’s Fashion Workshop. You will need to speed 500+ ASOS Tokens to unlock this item. The second reward is an heirloom that will unlock a new Fashion Story for your sims. You will need to spend 1200+ ASOS Tokens to unlock this item. The third reward is an heirloom that will unlock a new Photographer Carrier for your sims. You will need to spend 2000+ ASOS Tokens to unlock this item. The fourth and final reward is an heirloom that will unlock a new Photography Story for your sims. You will need to spend 3000 ASOS tokens to unlock this item. What are ASOS Tokens? ASOS Tokens are the new event currency used to buy all of the new rewards. They are not used for anything else in the game, other than the event. So no need to worry about saving them! Spend them on all the items you would like from the event rewards! There are many ways to obtain the ASOS tokens, let’s go over the ways to get them and the best routes to take to maximize your tokens per time. 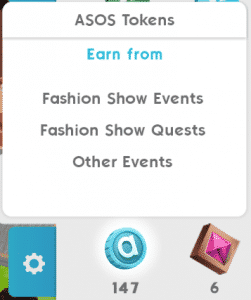 The first way to obtain the ASOS Tokens is to do the event activities. 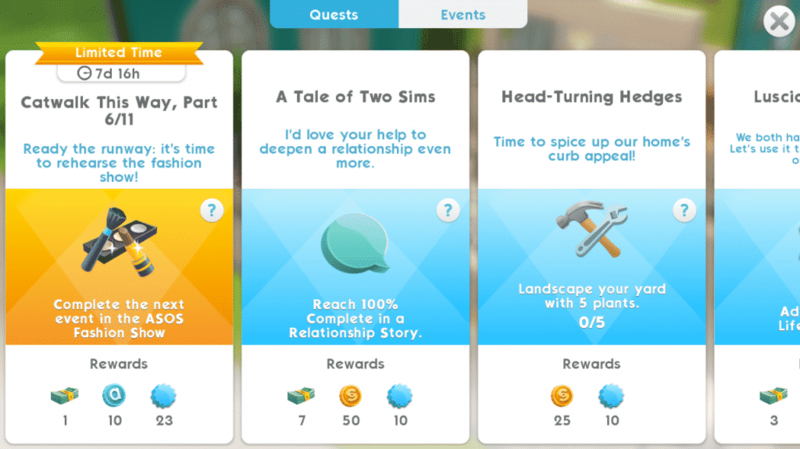 You can check out these events by clicking the ASOS logo on the top right hand corner of your game, then clicking the Activities tab next to the rewards tab. There are 4 different event activities you can do. The only downside to the event activities is they have quite a long cool down timer before you can repeat them again. So you would have to wait for the timer or rush it with SimCash. There are other things you can do to still earn ASOS Tokens while you wait on the Event Activities cool downs. Such as Hobby Practice Sessions, Relationship Events, and Working a Shift in your sims career. You can earn anywhere from 0 to 10 ASOS Tokens for each of these. The best part about earning the ASOS tokens this way, is that there is no cool down on these actions. So as soon as you finish you can jump right in and do them again! You will not get more ASOS Tokens for longer activities, so it is best to do the “Quick” options that only take a max of 1 hour to finish. This way you can collect more tokens quickly.